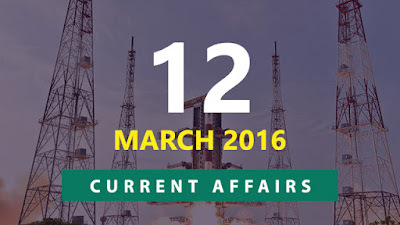 Hi Aspirants..Here is the Current Affairs Quiz for 12 March 2016 with Multiple Choice Options. Trending topics include Aadhaar Bill, 2016, 21st Law Commission of India, Irani Cup Cricket Title 2015-16 etc. Attempt the Quiz and check more details. 1) Lok Sabha on 11 March 2016 passed the Aadhaar (Target Delivery of Financial and Other Subsidies, Benefits and Services) Bill, 2016. It was a ___ bill? 2) Who was recently appointed as the Chairman of the 21st Law Commission of India? 3) Which team has recently has won the Irani Cup Cricket Title 2015-16? 4) ISRO on 10 March 2016 has successfully launched India’s sixth navigation Indian Regional Navigational Satellite System (IRNSS) 1F satellite.It was launched by ISRO’s workhorse satellite launch vehicle? 5) Cabinet Committee on Economic Affairs (CCEA) has recently approved Pradhan Mantri Ujjwala Yojana (PMUY) for providing free of cost LPG (cooking gas) connections to? 6) Garuda Shakti IV which began in Magelang on 10 March 2016 is the Joint Training Exercise between India and which country? 7) Naná Vasconcelos who passed away on 10 March 2016 is a acclaimed musician from which country? 8) Which bank on 9 March 2016 has rolled out iWork@Home programme for its women employees for up to a year? 9) How many countries will take part in the first Maritime India Summit 2016 scheduled to be held in April 2016 in Mumbai, Maharashtra? 10) Which state government has recently launched Mukhyamantri Santwana Harish Yojana to provide free medical treatment to road accident victims for the first 48 hours (2 days) in the nearest government or private hospital?